Free 3-Year Subscription to Working Mother Magazine! 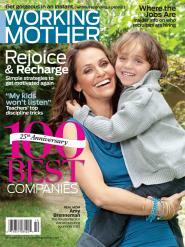 Receive 3 Years of Working Mother Magazine Free! This offer is through Rewards Country and requires you to complete a survey in order to receive the magazine. From reading reviews (I have never read Working Mother Magazine), it seems this is for mothers that work as high-paid executives and not your typical low to middle income mother. I wouldn’t recommend paying for this unless you know its something you want, but a simple survey (really easy to fill out) would be a great way to try it and if you don’t like it, you can always contact the publisher & have it sent to your local library instead.